Organic post reach for brands could soon be a thing of the past. The prevailing view is that brands should expect to see organic post reach of between 1-2%, with the end of organic reach looming on the horizon. The increasing volume of Facebook brand pages adds more posts that compete for visibility in the algorithm. Many also see this as a move to further monetise brand pages. There are several great posts outlining and showing evidence for the #FacebookZero hypothesis. However, does this apply to ALL posts? Do all pages risk seeing an end to organic reach? Does this mean that all brands need to be investing in promoted posts? The reality is likely to be more complex. While Facebook may wish to further monetise the site, it’s not likely to be as clear-cut as a total end to organic reach. We tracked three pages to test our hypothesis. We looked back over the last three months to see what the impact on organic post reach was. Were pages following or bucking this supposed trend and, if the latter, what were they doing right? We also looked to see if there was a link between paid advertising and increased organic post reach. The three brands are all active on Facebook. All have posted regularly since the January, with some variance in frequency. 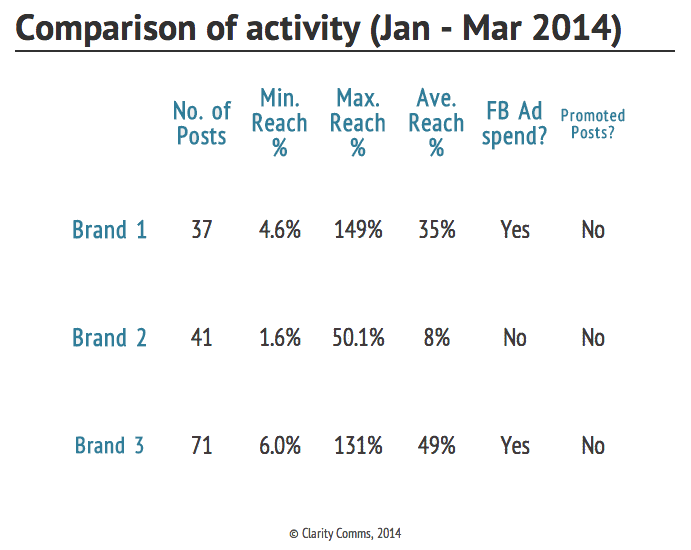 The table shows that there is a significant variation in the reach achieved by the brands’ page posts. 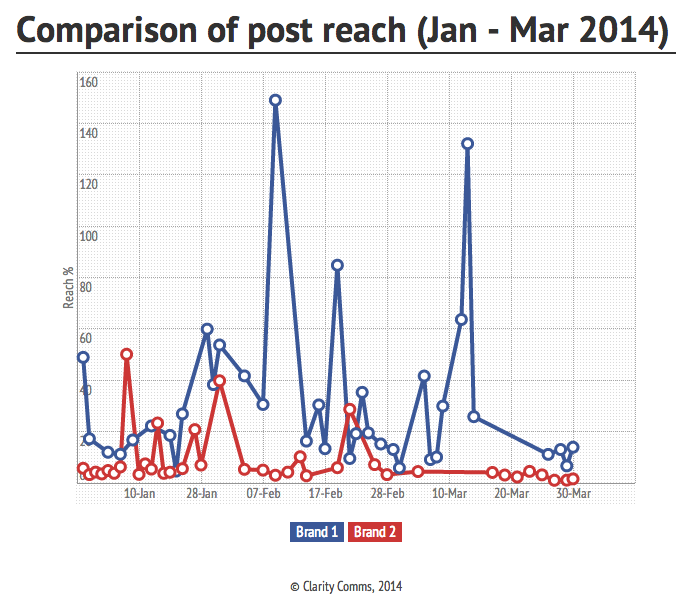 Two of the pages have massive differences between the lowest and highest post reach. Two of the three are experiencing average reach many times higher than the mooted 1-2%. The variances can be seen in the charts below showing Brand 1 and Brand 2 post reach for all posts over the last quarter. Brand 2’s recent activity has been more sporadic. The trend for its posts shows significantly lower reach in line with where Facebook is heading with organic post reach. Brand 2 hasn’t engaged in any advertising or promoted posts. Brand 1 continues to experience high levels of reach. The determinant for this is the posts themselves: great content is resonating with the brand’s audience. The fact that both brands 1 and 3 have been spending on ads is a red herring. There is likely to be a small benefit – spending most likely does add a slight boost to a page’s organic reach – but the core driver is the content of the posts. What should page owners be doing? The jury is unanimous on the overall trend of declining organic post reach for brands. Posts generating little or no engagement will only be seen by a minority of consumers and this reach will equate to 1.5–2.5% of the page’s likes. This doesn’t appear to be ubiquitous however. So what steps can you take to mitigate the risks? Track post reach and engagement: Do this for each post, and look at reach as a percentage of audience. If you go back three or even six months then you’ll be able to see the overall trend. Tracking engagement is vital as there is a link between engaging posts and good reach. Look at your content strategy for Facebook: It’s likely that some pages just won’t be getting the love they deserve. If you don’t care for your page, then why should Facebook? Brands that develop defined strategies and plans for great Facebook content see great results. Facebook can be a brilliant channel but only if you approach it strategically and creatively. Monitor in real time: Posts that really hit the spot do so very quickly. When you see a post working, put some budget behind it to boost its visibility. It is still likely that posts getting a great response from your audience are going to be served to others. Facebook’s algorithm aims to give users the best content it can.Posts that resonate quickly, getting high levels of comments, likes or shares will continue to be seen. Don’t panic! : Brands using the channel strategically and posting creatively have less to worry about. It is worth looking at diverting some spend into tests of both promoted posts and advertising. It doesn’t mean throwing hundreds of pounds at every post. Test, evaluate and learn to see if, and when you should invest. It’s no surprise that page owners will be expected to invest more in their pages. Facebook is a business and it continues to look at methods of generating revenue. If this move to zero post reach removes lazy, dull or ill-considered posts from users’ streams then everyone benefits. Facebook clearly sees brand pages as communities that brands need to invest in. Don’t worry if you’re advertising already. Aside from the monetary motives, the move to #FacebookZero is aimed at the brands that don’t really get it. If it means brands have to work harder then that is only a good thing. We’ve all seen posts that defy any logic and are utterly pointless. Perhaps it’s B2B brands that should be most worried by this development. Their time on Facebook may be up… and not before time. * A version of this post first appeared on the Econsultancy blog.